We invite you to explore India - the Land with infinite beauty ! Whether you soar high into Himalayas or peer under the ruins of the Ancient monuments dotting the landscape of India, you will cherish the experience long after your visit ! This India Travel Guide on Rameshwaram Temple is free from any commercial interest! This site is dedicated to promote India - the vast subcontinent, its glorious past, magnificent landscape and its infinite variety. The sacred land of Rameshwaram is popularly known as the Varanasi of the South. This is a famous pilgrim spot for both Shaivites and Vaishnavites alike. A Hindu pilgrimage to Benaras remains incomplete without a pilgrimage to Rameshwaram. Rameshwaram temple is one of the most venerated and oft visited shrines of Lord Shiva. Pilgrims aspire for a holy dip in the sea at Dhanushkodi which is revered as Sethu Theertha where Bay of Bengal ( Mahodathi) meets the Indian Ocean (Ratnakara). The sanctity and antiquity of Rameshwaram is summed up in an old saying 'Aa Sethu Himachalam'. Ancient puranas and Vedas describe the Sethu Yatra - Agneya, Bhagavatha, Padma, Shiva and Skanda Puranas to mention a few. Sethu Yatra is also extolled in several Sanskrit and Tamil works from the period of Valmiki Ramayana. Lord Ramanathaswamy of the Rameshwaram temple has sung in praise by the four Saivite saints Appar, Sundarar, Sambandar and Manickavasagar. Saint Thayumaanavar was a staunch devotee of Goddess Parvathavardhini, the consort of Ramanathaswamy. Rameshwaram is the place from where Lord Rama built a bridge across the sea to rescue Sita from her abductor Ravana. Rameshwaram is also the very place where Rama worshipped Lord Shiva to cleanse away the sin of killing Ravana. The presiding deity of the Rameshwaram temple is Linga of Sri Ramanathaswamy. This island temple is located off the coast of Sethu Mahasamudram of Tamil Nadu. This shrine is regarded as the 8th of the Tevara Stalams in the Pandya region of Tamil Nadu. This religious island of Rameshwaram is spread across an area of 61.8 km. Very interestingly it is in the shape of a conch. The Rameshwaram temple occupies a major portion of Rameshwaram. According to Hindu mythology, Lord Rama performed thanksgiving rituals to Lord Shiva, after his triumph over Ravana. The Ramanathaswamy temple is believed to have been built by Lord Rama himself. Lord Rama directed Hanuman to bring the lingam from Kailasha and due to delay in Hanuman bringing the Linga, Sita prepared one of sand, before the auspicious hour. This is the same linga of Sri Ramanatha that is worshipped in the temple. Lord Rama also worshipped Tilakeswarar at Devipatnam enroute Sri Lanka. There is also a shrine of Sethu Madhava and Lakshmi at Rameshwaram. Sethu Madhava is also referred to as Sweta Madhava, the term Sweta means white stone on which the image is made. In the main sanctum sanctorum is the Linga of Sri Ramanatha, the same one that Lord Rama has sanctified. The vimana is three storeys tall and it contains the images of Hanuman, Agastya Linga and the Gandamandana Linga. The Linga of Vishvanatha which is believed to have been brought by Hanuman, is enshrined in another sanctum to the north. The shrine of Visalakshi the consort of Visvanatha is housed nearby, while Parvathavardhini, the consort of Lord Ramanathaswamy is enshrined in a sanctum to his right. With the sea on the eastern side of the island the Ramanathaswamy temple stands tall with 1200 gigantic columns. The main gopurams of this temple are 54 m tall and 1220 m of magnificent corridors embellish and render immortal fame to this temple architecture. Of the 36 theerthams, there are in all 22 wells around the temple and significantly, the water in the wells taste different from each other. The Agnitheertham which is about 100 m away from the temple is the place where Lord Rama worshipped Lord Shiva to absolve himself of the sin after killing Ravana in battle. At a highest point in an island is Gandamandana Parvatham, the place where Lord Rama is believed to have placed his feet of a chakra or wheel. This is 2 km away from Rameshwaram. On the eastern end of the island at about 8 km distance from Rameshwaram is Dhanushkodi. The Adam's bridge, the boulders around the sea between Sri Lanka and this place is believed to be used by Hanuman to reach across Sri Lanka. Dhanushkodi was completely destroyed by cyclones in 1964. The Kodandaswamy temple with the idols of Rama, Lakshmana, Hanuman and Vibhishana surrendered to Rama here. This temple was the only remnant out of the cyclone that submerged Dhanushkodi. It was at Dhanushkodi which is the eastern most tip of the island that Lord Rama with the tip of his bow destroyed the bridge that he had built between the island and Sri Lanka after his victorious return. This is the temple of Kodandarama located on the way between Dhanushkodi and the Ramanatha temple. While Thirupullaani is the site where Lord Rama sojourned on his way to Sri Lanka, Devipatnam is the home of the Navapaashaanam, with medicinal properties, installed by Lord Rama. This temple is an evidence of the Dravidian architecture. It takes the credit of being the largest temple in India. The temple has been built by different rulers over centuries beginning from the 12th Century. This huge island temple which could be reached via the Pamban bridge across the sea, is known for its ornate corridors and towers and the 36 theerthams. The Rameshwaram temple is spread over an area of 15 acres. The lofty gopurams, massive walls and the colossal Nandi render the temple awesome to the devotees. Four thousand feet long pillared corridor with over 4000 pillars which is supposedly the longest in the world is astounding to watch. The carved granite walls are all mounted over a raised platform. The rocks for the granite pillars of the corridor were brought from elsewhere in Tamil Nadu across the sea. The Rajagopuram on the eastern side towers to a height of 126 feet and it has nine levels. The western Rajagopuram is not as tall as the eastern one but pretty much impressive. The stuccoed image of the Nandi is about 18 feet tall and 22 feet in length. It was Parakrama Bahu of Sri Lanka who first built a masonry structure over the ancient shrine in the 12th century. The Sethupathy rulers of Rameshwaram seem to have completed the rest of the temple. In fact several of the vimaanams at this temple resemble the Pallava architecture, between 12th and 16th centuries. The long corridor dates back to the 18th century. This temple enjoyed the patronage of several monarchs including the kingdoms of Travancore, Ramanathapuram, Mysore and Pudukkottai. This temple is the abode of one of the twelve Jyotirlingas of India. This temple is also considered one among the four sacred pilgrim centres of India, the others being Badrinath in the North, Puri in the East, Dwaraka in the West. Rameshwaram is the only place dedicated to Lord Shiva while the other three are dedicated to Lord Vishnu. There are six worship services carried out at this temple daily. The first one begins at 5 am. There are two annual Bhrammotsavams commemorated at the temple during the months of Aadi and Maasi. The 36 theerthams of which 22 are inside the temple are believed to possess medicinal properties. The Agni theertham symbolically refers to the ocean while the kodi theerthams is located within the temple itself. Another point of interest near the temple is the Gandamandana Parvatham which bears a shrine with footprints of Lord Rama. Rameshwaram is well acclaimed at a 'parihara sthala' where it is believed that all sins will get absolved. Many perform Shraadha (ceremonies) for their ancestors and do Naga Prathistha (installation of serpent deity). 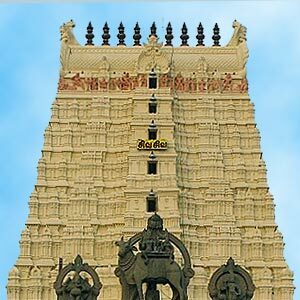 Rameshwaram is not only interesting from the standpoint of its association with religion and the legend of Lord Rama but also from a structural and architectural standpoint.